Sometimes just getting there is. Headed to the river on Friday am and got stopped by traffic backed up from a big multi-car wreck and rollover in the snow. I stopped and was sitting there waiting when Bang! Crash!! Boom! Some 18 year old lady Einstein in a big truck came in a little hot behind us and hit 2 other cars trying to stop.One car hit me and knocked me into the plate steel bumper of a 60ft chip truck.....it didn't move. Cracked my radiator,drained out all my fluid, busted out my headlight, bent both front and rear bumpers and quarter panels and worst of all it scared my dog!!! I sat there for 6-7, hours fuming the whole time. I was dead in the water and had to get a tow. I was the last car out there when the cars started moving again. I endured the looks of hundreds of cars as they went by. "There's the guy that caused this whole thing" I could see them mumble as they glared at me on the slow drive by my wounded truck. I finally got a tow,went back to bend and got another vehicle to head back to the river by nightfall. 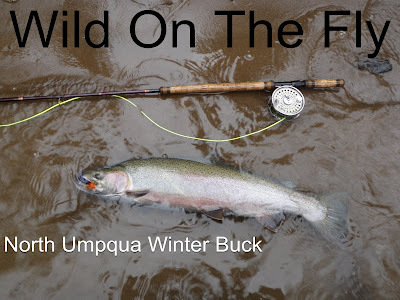 When there is winter steel in the river and you have a trip to guide the next day, you get there no mater what. Guides are never late........at least this one isn't. Fishing was good, catching not so much, a good yank and that was all. Water is blowing out as we speak and will probably be out for a while.......stay tuned. It's hard to take a good picture when you just hooked the fish of 3 lifetimes.Brett was shaking like a drunk coming off a 5year bender,thus the bad picture. No need for a Redbull after this fish.My buddy Brett fished hard for 4 days and touched one fish. Then this bad boy gave him a yank and a fight like you read about. Brett responsibly kept this big wild fish in the water at all times and did not try to get an exact measurement or a good picture......even though it would have been nice. The health of the fish was more important. This big buck was only sidelined long enough to regain his wind and swim away strong. A quick measurement against the rod put this fish in the 40+inch range. And from the obvious girth this fish was easily over 20lbs.Oh yeah, that's a 13'6 Meiser handle in the water for scale. Kind of makes it look like an Echo practice rod. Caught on the swing, this huge fish jumped multiple times and about left the park on a couple of occasions. When last contacted for a comment Brett kept murmuring things like" Fish Powerful!, and Oh Larry! as he wiped the drool from his lips. He has been under 24 hour supervision and has been on doctor prescribed medication since the incident to control the shakes and involuntary fish related vocal outbursts. Just returned from a stellar trip down to the NU. We found fish despite low and clear conditions. Here are some photos that tell the story well.